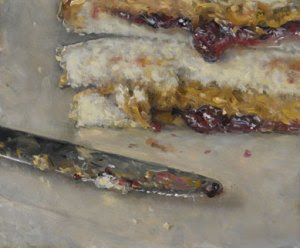 I fell head over heels in love with a 7.5″x 10″ oil on linen painting of a PB&J sandwich. A few years ago I stumbled across Duane Keiser’s website: A Painting A Day. He paints the most ordinary and fantastic things like a cupcake, chocolate covered cherries, a lollipop. eggs, onion, lemon slices, and wax lips! You can now buy a print of PB&J, and believe me I’ve thought about it. But one day, I want the real thing. Or a kitchen wall covered in his little gems. Or if I’m really lucky, this beauty. For the record, he does paint more than food.